I met Jayanti Seiler at the Atlanta Celebrates Photography Portfolio reviews and enjoyed our conversation about the complex relationship between humans and animals. 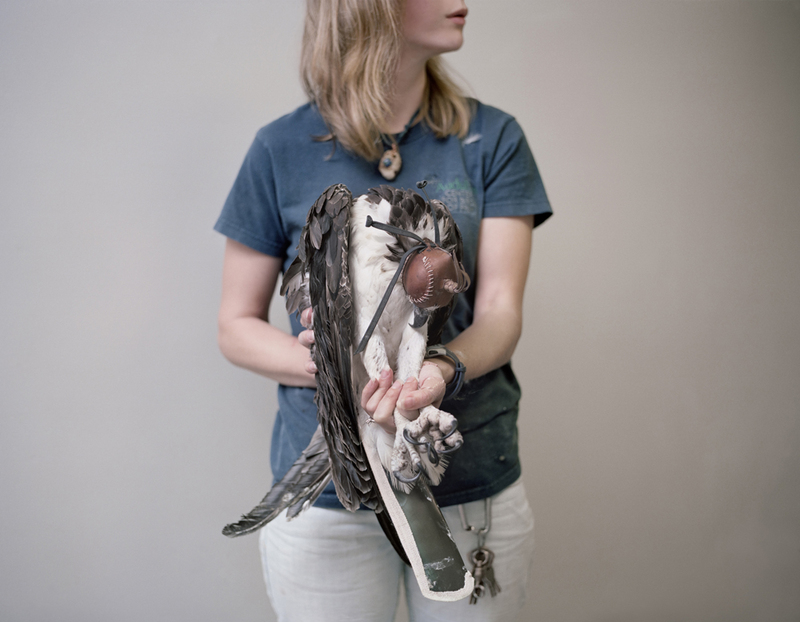 Her project, Of One and The Other, recently exhibited at the Southeast Museum of Photography in Daytona Beach, Florida, is a reflection of her commitment to the animal world. She is not just an observer, but very much a participant in the animal rescue community. Her work considers the role of the captor or savior of wild animals and the inherent issues that arise from the care taking responsibilities of those involved. Jayanti Seiler is a photographer, video artist, and an Assistant Professor at the Southeast Center for Photographic Studies in Daytona Beach, Florida. Jayanti’s art weaves respect for nature, the constructed photograph, and an acknowledgment of the photographic agenda to infuse her subject matter with a level of sensitivity. She seeks to raise awareness regarding our human-animal relationships and interactions with fellow inhabitants of this planet. Her long-term participation in wildlife rehabilitation continues to inspire her ongoing body of work, Of One and The Other, which is currently featured on The New York Times LENS blog. 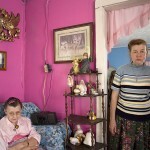 This series of photographs examines the dichotomous and complex relationships between people and animals. 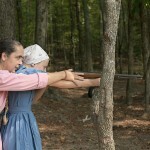 When the work was exhibited at the Southeast Museum of Photography in Daytona Beach, Florida in 2014, it was concurrently featured in The Daily Telegraph in London. In 2014, Jayanti was commissioned by Big Cat Rescue in Tampa, Florida, the largest accredited sanctuary in the country dedicated entirely to abused and abandoned big cats, to create a film surrounding a rescue mission for a cougar named Mickey. The film was widely featured, including the Discovery Animalist Channel and BigCatRescueTV. 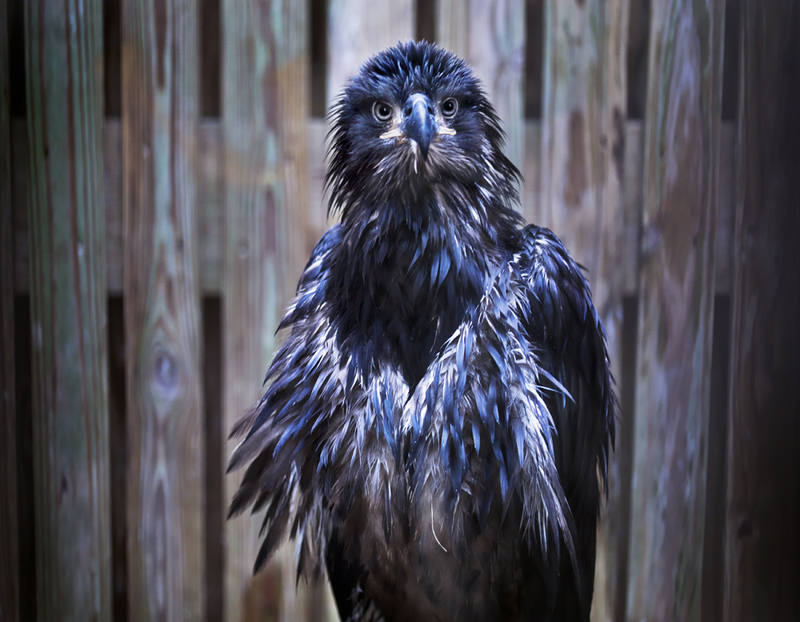 Jayanti was a selected speaker at the 2013 Society for Photographic Education Southeast Regional Conference, where she presented her photography series, Clemency Raptor, which featured a vignette of life for birds of prey while in wildlife rescue and rehabilitation centers. 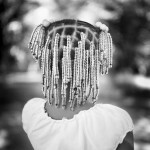 In 2010, Jayanti became a Guardian ad Litem (GAL), a court appointed advocate representing children’s rights in the foster care system in Alachua County and created the experimental documentary film and installation titled, Docket, featuring monologs of former foster care children and GAL volunteers to heighten awareness about the child welfare system. 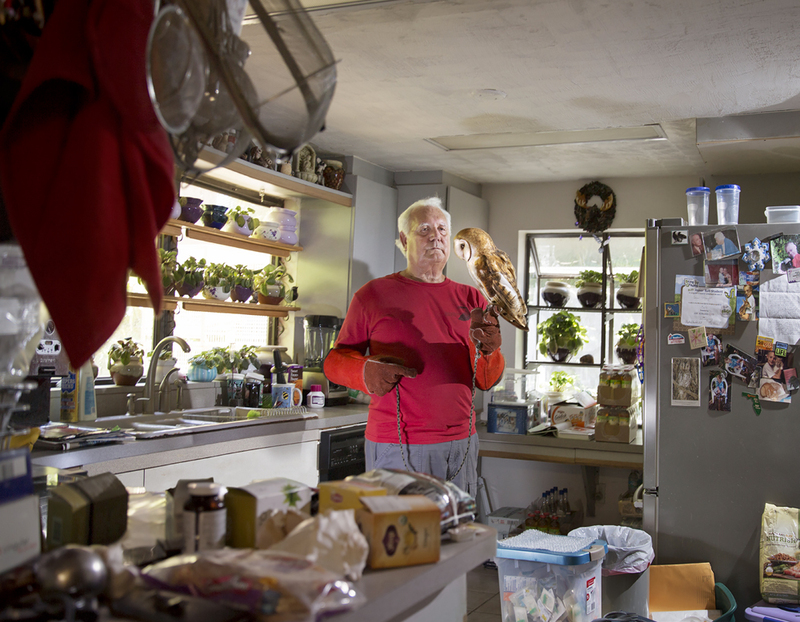 The film was screened at the Pride Community Center of North Central Florida, and the Alachua County Partnership for Strong Families in Florida and the corresponding video installation was exhibited at University Gallery in Gainesville, Florida. 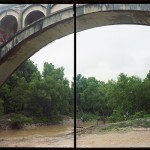 Her work has been exhibited widely including Harvard University, Museum of Contemporary Art Georgia, Washington State University, and the Florida Consortium of Art Schools. Jayanti received her Master of Fine Arts Degree in 2011 from University of Florida. Upon acceptance, she was granted a fellowship to study photography and work as a Graduate Teaching Assistant at the School of Art and Art History graduate program. She was the sole recipient of this award as well as the Dennis and Colette Campay Scholarship. 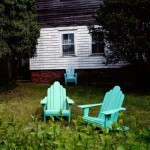 Jayanti earned her Bachelor of Fine Arts Degree in Photography from the Rhode Island School of Design in 2000, where she received the T.C. Colley Award and Scholarship. In the collection, Of One and The Other, dichotomous and complex relationships between people and animals are explored through found and constructed human-animal encounters. The photographs are a call to revere the natural world while living in a modern one in which the two realms often conflict. As participant, observer and storyteller, I spent time among people and animals on ‘the border’ at wildlife rescue and rehabilitation centers, 4-H club livestock auctions, domestic and exotic animal shelters, wildlife sanctuaries, taxidermy shops, traveling circuses and encounters for profit. 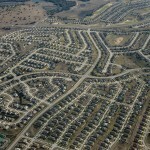 I was immersed in both the commonalities and conflicts of interest between these neighboring groups. I found various notions of romantic idealism used to rationalize efforts to coexist harmoniously, but also control, consume and rule. The images are performances that reconcile intentions with these dissonant motivations. The capturers become the captured as they are bound by their commitments to preserve and protect. Conflict is found again in efforts to remain at a distance, pictured as not only humane but also essential to survival and conservation in the world of wildlife rescue and rehabilitation. Others blatantly bridge that gap and sell encounters with big cats under the same guise. The love and tenderness of the child who raises an animal from birth, who then must find the courage to send it to slaughter and begin the process again; the altruism of individuals who dedicate their lives to preserving the health of debilitated wild animals that otherwise would have been euthanized; the care the taxidermist takes when meticulously crafting keepsakes from hunted animals; big cats purchased as cubs, raised in captivity and discarded, live out their lives in captivity; these disparities are woven into the fabric of the photographs, calling attention to undefined slippery boundaries of displaced intentions and notions of adoration, escape, capture, release, and conservation. Of One and The Other is an acknowledgment of the myriad contradictions, the questionable and complex borderlands of modern life and wild nature. I portray, that irrespective of our own biases, within every interaction and encounter, there deserves to be further understanding of our obligations and impact. This body of work seeks to inspire consideration of the complexity and depth found in the relationships between animals and people from all points along a spectrum that spans the chasm from lifesaving to exploitation. I have always been very passionate about the wellbeing of animals and I was compelled to explore the many layers of complexity I found within our relationships with them with my photography. I have volunteered with Wildlife Rehabilitation and Rescue Centers for years in order to experience firsthand what goes into rehabilitating wildlife. My volunteer work led me to want to photograph the strange world of rescue and rehab for birds of prey and their caretakers. This was a way for me to peer behind the scenes and insure that I utilize an informed perspective when making the photographs. I made images at the Audubon Center for Birds of Prey in Maitland Florida and the Marine Science Center in Ponce Inlet Florida and I was fascinated by the blend of altruism and clinical detachment that I saw in the caretakers due to the volume of death that comes with the job. The rehabilitation workers have to remain at a distance because this is essential to bird’s survival in the wild. I wanted that altruism and detachment to come through in the images taken at Audubon Center for Birds of Prey in Maitland. The image depicting the bird of prey slumped over, wearing a hood over his eyes, is a human method of keeping him relaxed while he is examined. Interactions between animals and people in rehabilitation centers are unique because these relationships would not occur naturally in the wild. I captured the remarkable encounters that I made with the birds. Several non-releasable birds reside in simulated habitats and learn to adapt to their human surroundings. These birds looked back at me with curiosity and recognition, resembling human expressions. 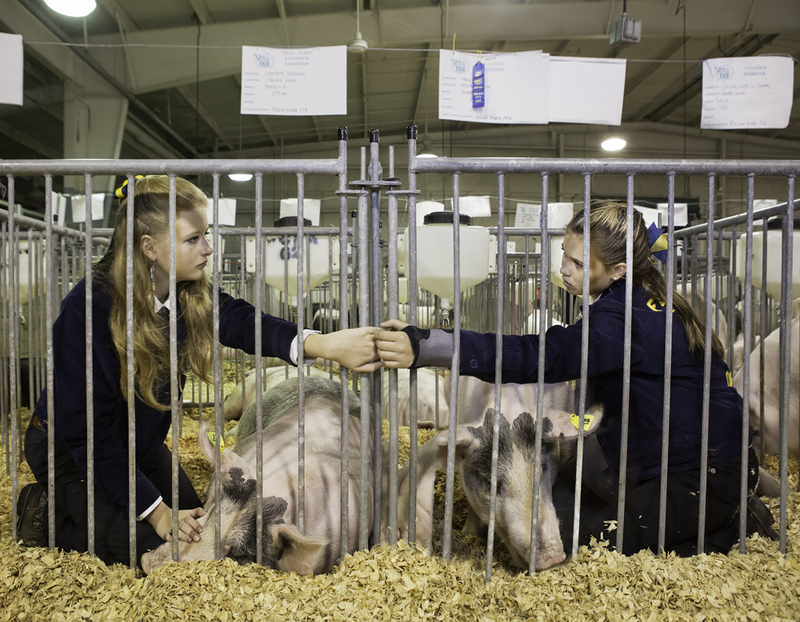 I wanted to portray those rare moments where the wall the caretakers put between themselves and the animals breaks down and you see a tenderness and connection. They are altruistic in their attempts to shield animals from harm and repair. The juxtaposition of the majestic characteristics of the birds of prey and their man-made habitats clash unmistakably, emphasizing their and our own temporary, if not permanent separation from the natural world. I was interested in the delicate harmony at stake in the encounters because it is traumatic for the birds to be taken out of their natural environments. 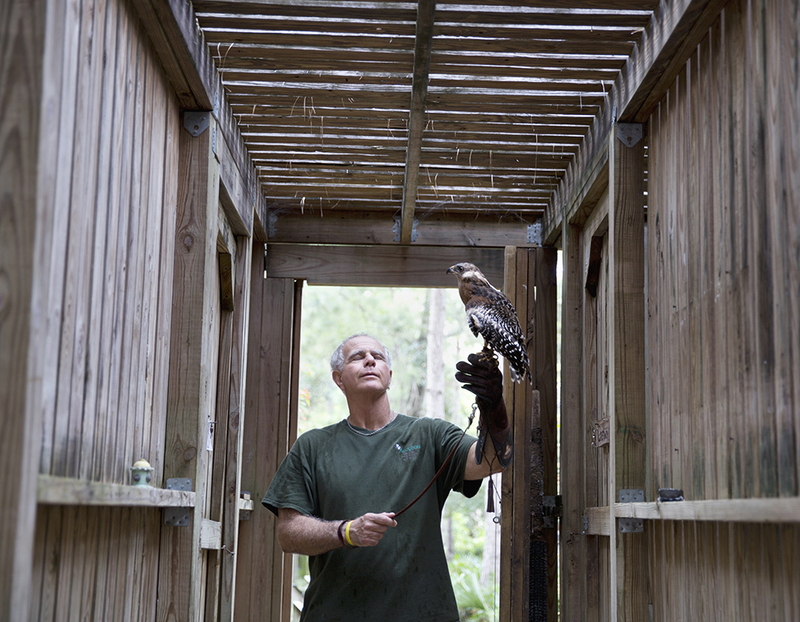 While making the body of work about birds of prey titled, Clemency Raptor, I participated in a cub encounter at a private sanctuary called Dade City Wild Things in Florida where I paid to pet and swim with a baby tiger named Tony. This eye opening experience launched the project in a new direction and it became more personal for me. During the encounter I was caught up in the moment being in close proximity with a beautiful wild animal, although there were signs that Tony was not being treated humanely. Although I put those concerns aside for the time being until I returned home and discovered an announcement from the Animal Rights Foundation of Florida that explained how paid cub encounters are inhumane and abusive. I was horrified because that accusation lined up in many ways with what I saw. I researched cub encounters further and discovered that it is a bleak existence for these animals. 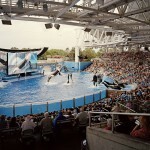 Their caretakers claim they are raising awareness of the animal’s plight in the wild yet keeping them in less than desirable conditions in captivity and putting them through undue stress by working them long hours is the reality. I felt I was a participant in this duplicity or even a victim as was the cub. The experience struck me and I was radically altered therefore I searched for a way to right my wrong with my photography. I also took measures to help stop the mistreatment of cubs by aligning myself with animal rights groups to help investigate encounters in order have better restrictions and regulations put in place. The two images of the tiger cub named, Dahlia, depict a day in her life, morning and night. 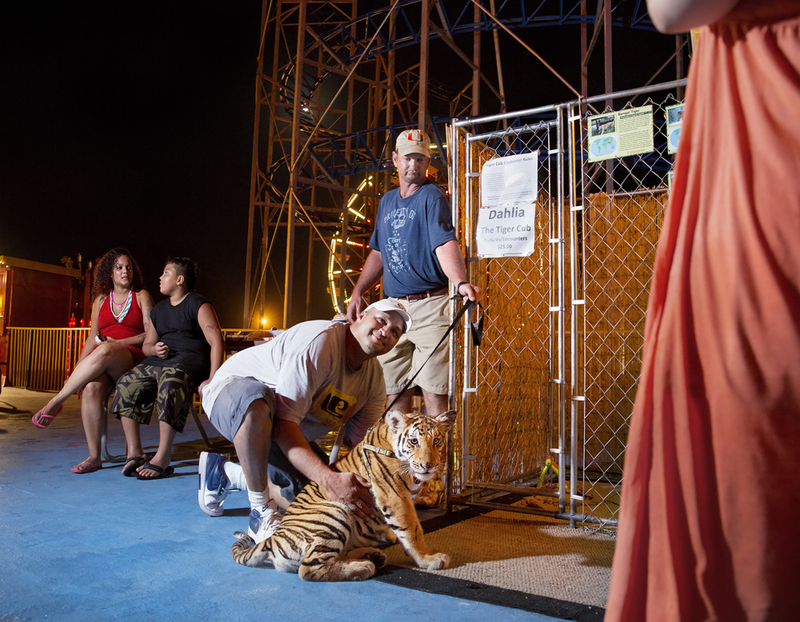 Her caretakers were selling cub encounters with her around the clock for a week at the Daytona Beach Boardwalk in Florida. 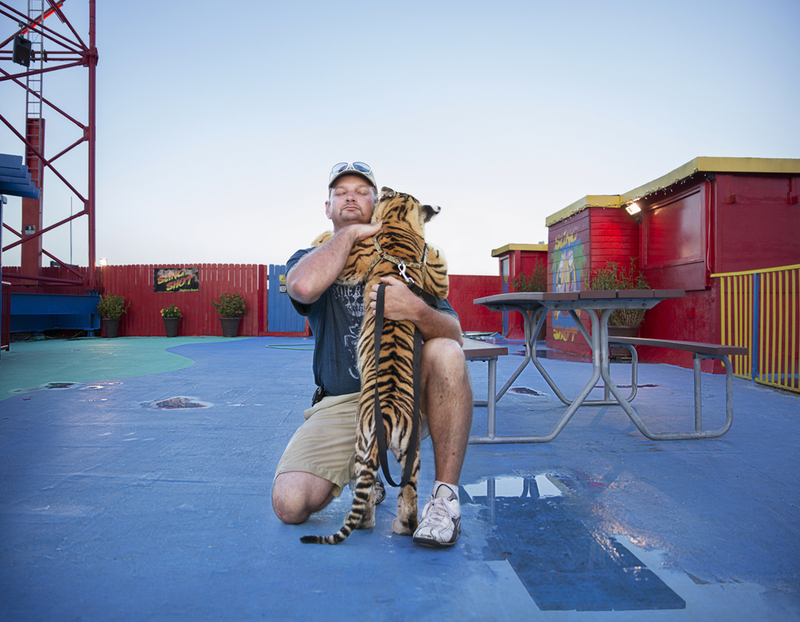 I was sent to the site to investigate and make pictures for Big Cat Rescue in Tampa Florida. The owners welcomed me to make images for my project. 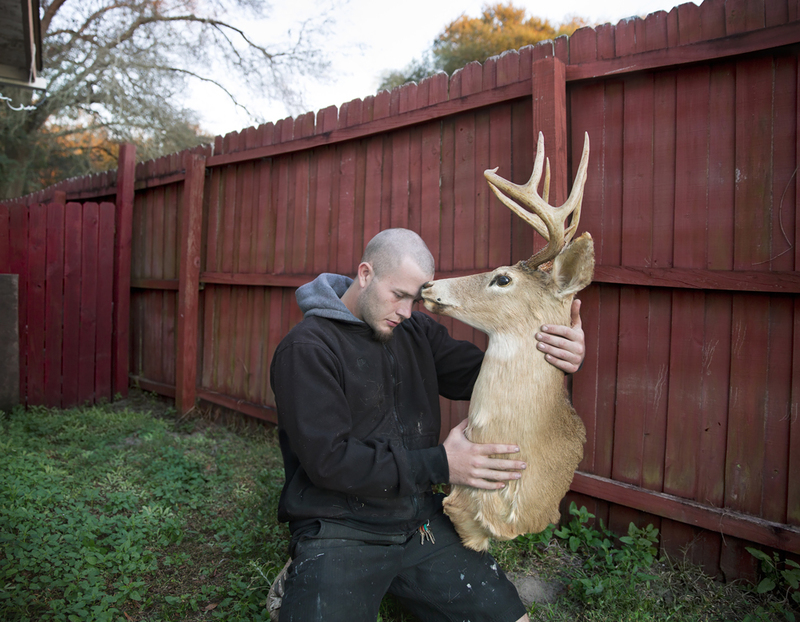 In my project, images of people hugging wild animals are placed next to images where they are potentially being exploited to address the implications of crossing boundaries with wild animals. What I came to understand from my own cub encounter and from meeting these people inspired me to want to make an even greater impact with my photos. Of One and The Other addressed the fine line between adoration and exploitation. I knew from my personal experience that the appeal and accessibility of cub encounters is rarely scrutinized. You feel you are making a connection with the animal, but at what cost? 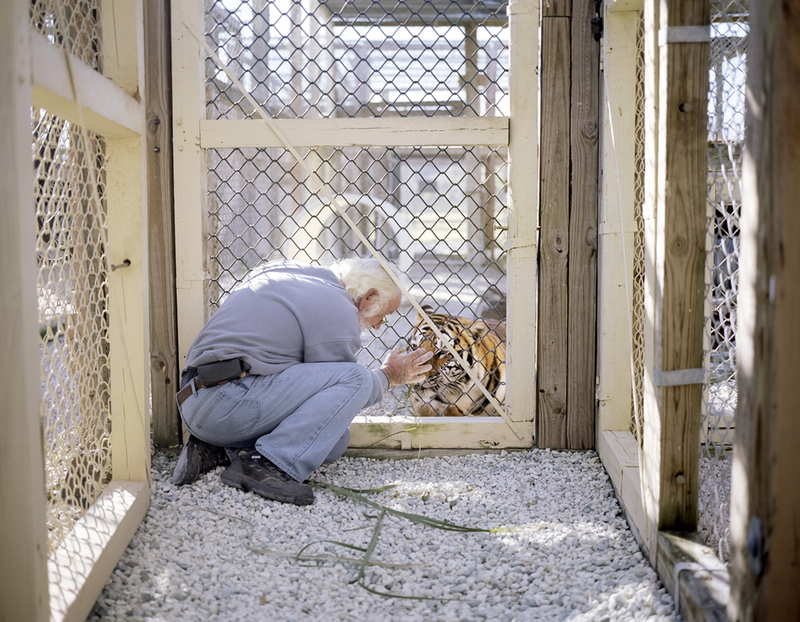 Although wild animals in rehab centers appear detached from their human caretakers this an example of how the boundaries between the man and wild are being honored. To remain at a distance is not only essential to survival and conservation, it is humane in the world of wildlife Rescue and Rehabilitation. Preservation and protection are advocated for by private zoos that sell encounters with exotic animals, although they have very opposing sets of boundaries or lack thereof when attempting to domesticate wild animals by breeding them in captivity and profiting off of them. I am interested in the many strong belief systems backing the relationships we have with animals and justifications that support them. Love is more internal to people that honor boundaries with the wild. Not respecting that boundary when hugging a tiger although seems loving and something people may be seduced by, is feeding the consumerism of exotic animals, keeping them from their natural instincts. I found this topic multifaceted and deeply complex the further I investigated and invested in it. I approached people that were contrary to my own beliefs, therefore, I had to walk this narrow line as a professional and I tried to do that without judgment because all the people I met love animals. Taking a radical stance and portraying the darker side, showing it outright and directly such as gruesome animal abuse, could have the effect of repelling people. We are inundated with images of suffering from PETA and other organizations and that is only one approach. I sought a subtler means to reach a broader audience. I gave deep consideration to the form this body of work should take. To remain sensitive to this subject matter I immersed myself in different groups and acknowledged people’s stories to hear from all sides no matter where I stood personally. It is a controversial, multifaceted, and complex topic to take on and I want to make it evident in the work that you do have to look at this from many different angles. The image of the taxidermist holding the deer head was intended to address the complexity and irony found in our relationships. The image is symbolic of the topic of boundaries and belief systems, how they clash and overlap in society, and therefore in the photographs. There is manufactured tenderness found in the image of the man perhaps admiring his craft or showing remorse. There is the belief system that hunters have a closer relationship with nature then someone who turns a blind eye and buys their meat in a sanitized package in the supermarket because it is easier then killing and butchering it themselves. The juxtaposition of this photograph and the image of the woman bathing a paralyzed dog parallel two different connections with an animal. The dog has a blood born parasite and she was not expected to live. She would have otherwise been euthanized but was rescued by Journey’s End animal sanctuary in Deland Florida where she is tenderly cared for and is now 14 years old. 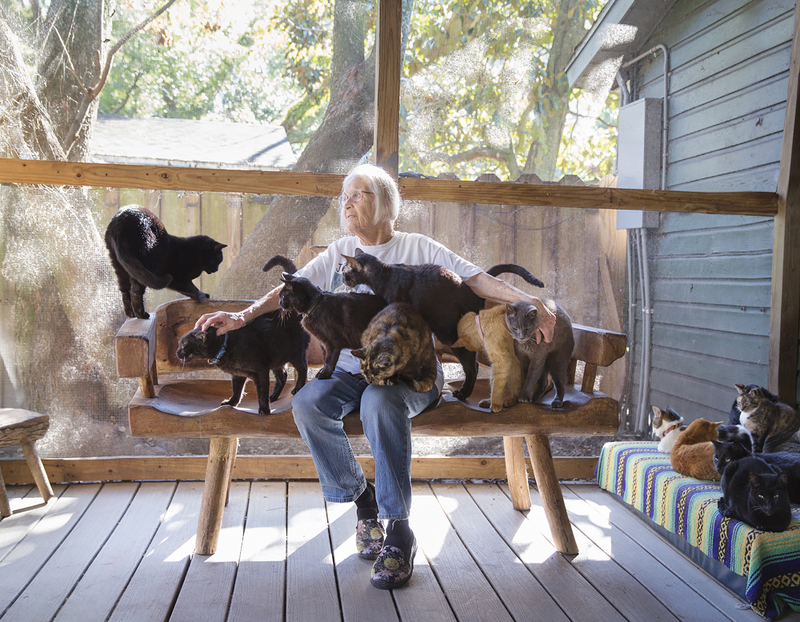 In one of the images, Florence Thout, owner of Journey’s End, is shown saint-like surrounded her rescued cats. 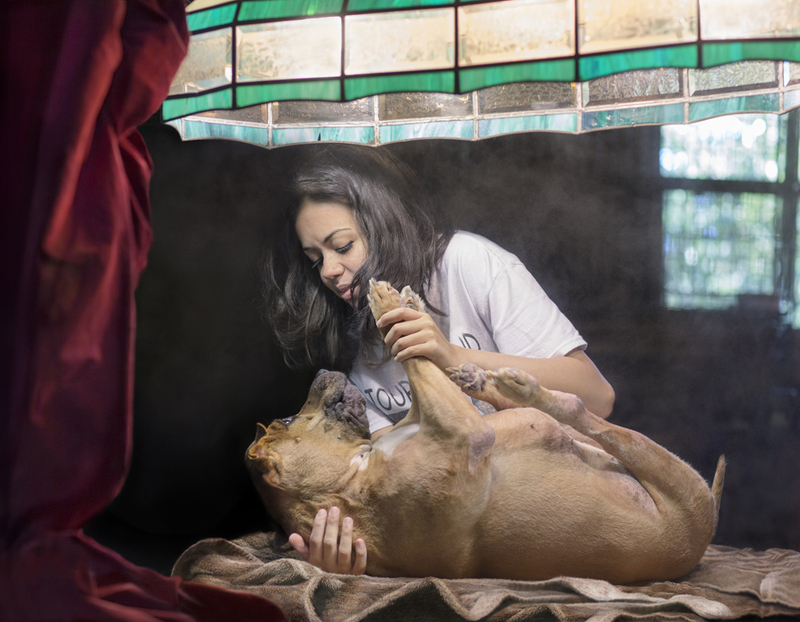 She converted her home into a sanctuary for abused and neglected domestic animals and she provides life long care for animals that would have otherwise been euthanized. The image of the young man hugging the lion cub in the tree was made at a traveling circus in Savannah Georgia, called Brian Staple’s Traveling Safari. It symbolizes the revere for the wild and the return to nature. What appears as an embrace, is subverted by the upward gaze of the lion cub, who perhaps longs for escape. Although dependent on the young man, both are vulnerable of falling, while cradled by the limbs of the tree. I want the viewer to be swept up in the romanticism of this image, perhaps as I was when I paid for a cub encounter, but to approach that desire with caution and understanding. Animals confined are unnatural although there is a genuine regard for some by their caretakers. Therefore, I was caught up in the ethics of what people were doing and the price animals were paying one way or the other. 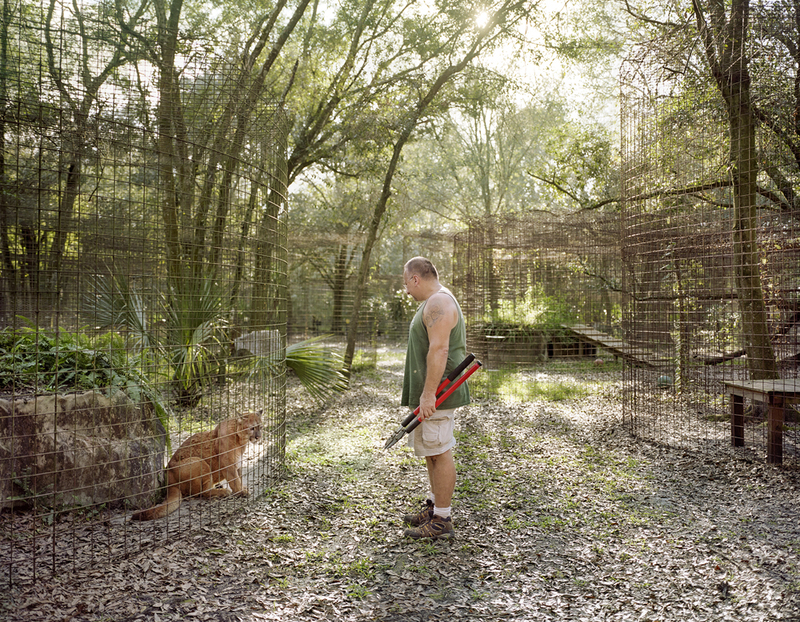 In another image, a caretaker at Big Cat Rescue animal sanctuary in Tampa Florida is shown holding sheers as he stares longingly or ambivalently into the cage of a cougar. This picture is also a symbol of the boundaries and the desire to commune with the wild. 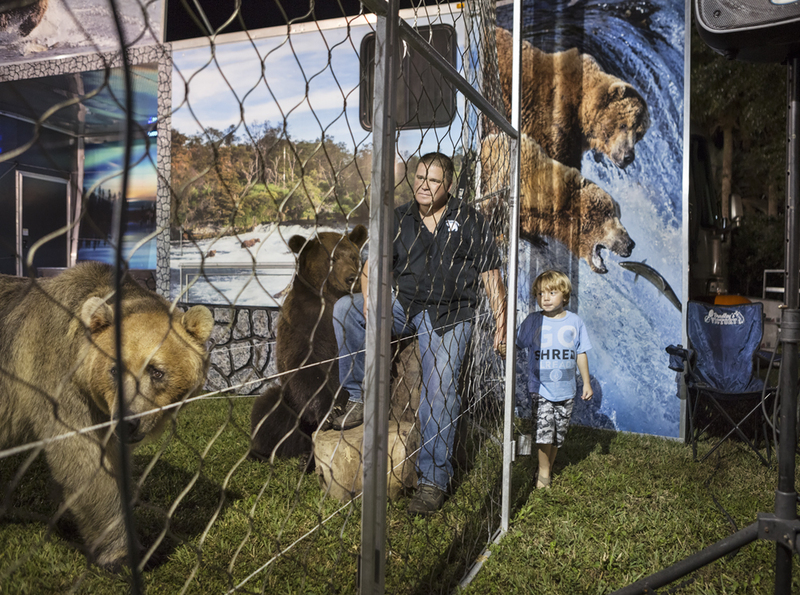 The image of a proprietor for a traveling Alaskan Grizzly Bear “experience” gives a different kind of consideration to boundaries and how they are either honored or crossed, as he sits casually inside a lit enclosure and stage with his captive bears while holding the hand of his son through the fence. 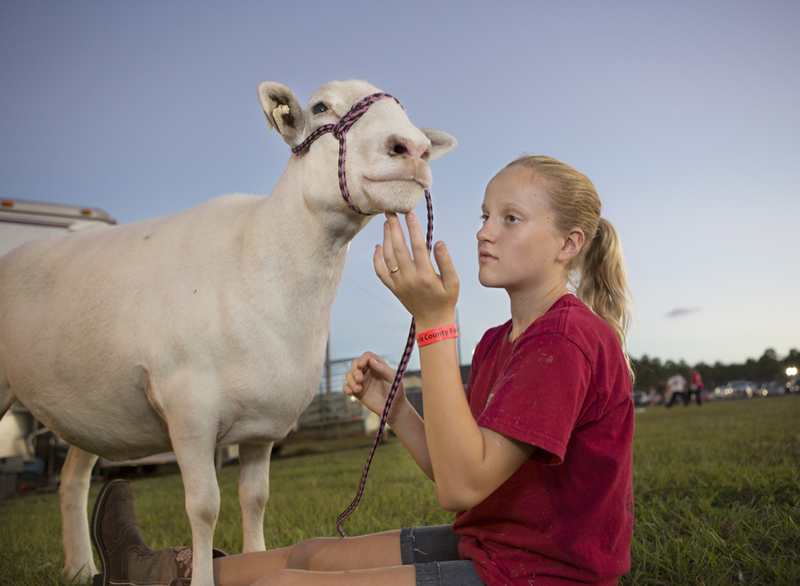 I have been photographing young people with their animals at the Volusia County Fair Livestock Auctions in Deland Florida since 2013. 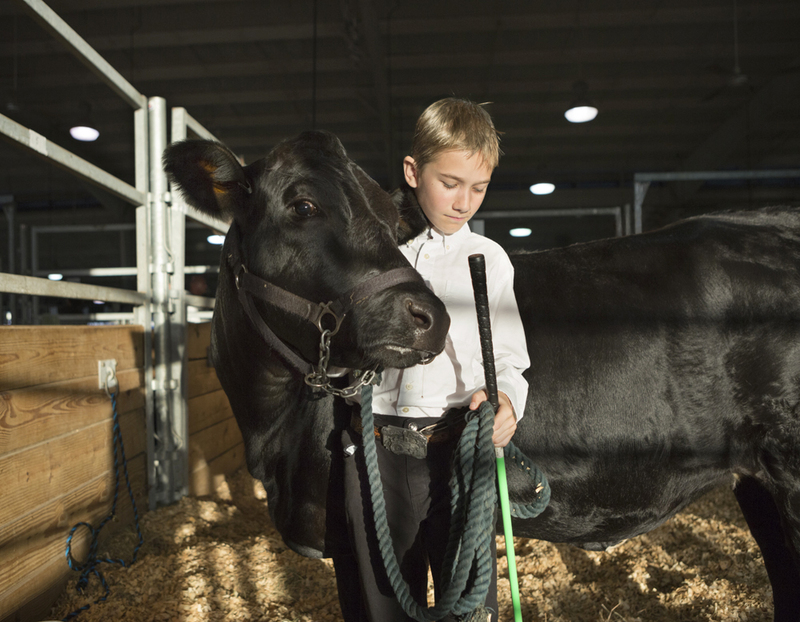 The 4-H youth organization is embedded in family tradition to instill discipline and responsibility in hopes of preparing youth for adulthood. 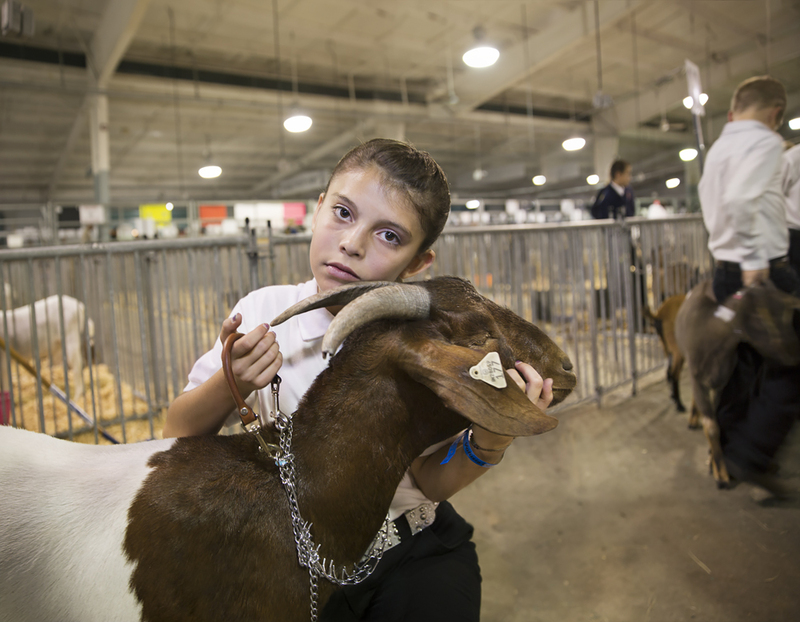 Children are instilled with the task of raising livestock animals from birth, which they do with meticulous care and pride, knowing that they will later give their animals up for slaughter. They have to mature quickly because they form very close bonds with their animals despite knowing what is to come. 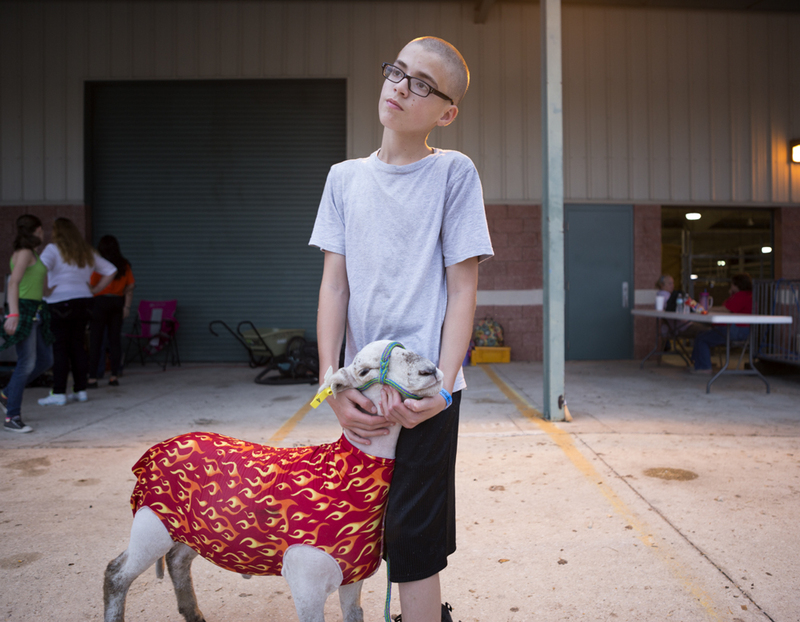 I seek to capture the emotional complexity and dedication as their attention turns inward the night of the auction and the reality of loosing their beloved animals weighs more heavily on them. Having formed such a close bond with an animal coupled with the strength to repeat the process again each year is remarkable. I cannot imagine making this commitment, let alone as a child. 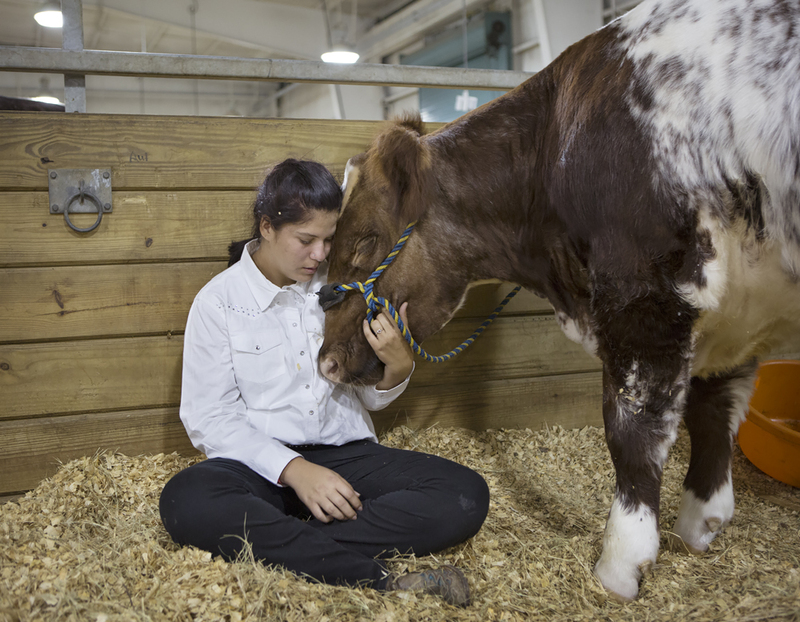 I am captivated by the collision of sadness, vulnerability, pride and accomplishment found in these unique relationships between young people and animals. The images are empathetic of the children and their dilemma. They believe deeply in what they are doing and I aim to capture that mixture of strength and emotion. I hope to bring an understanding of the various sides of the story; most everyone I met had good intentions and there were circumstances that led them to compromise. The relationships I depict are meant to be complex and not clearly definable to call upon a greater concern. I ask the viewer to consider the complexity of our relationships with animals and in every interaction and encounter, strive to honor the boundaries with them.